As we attended the opening night of London’s newest Banksy exhibition ‘IT BEGAN ON THE WALLS’ a retrospective of Banksy’s career the other night (covered here), we thought this would be a good time to share some pictures and offer up the locations of the last few works by Banksy remaining to be seen on the streets of London. In the Street Art world and popular culture as a whole Banksy is someone who needs no introduction, an artist, whose identity remains unknown, and whose works and status many adore and many loath, either way you cut it no other Street Artist has been responsible for the rising popularity of Street Art in the last fifteen or so years. There are currently as far as we are aware only six works to be seen despite his prolific output in the previous fifteen or so years, with many pieces been painted over by the authorities, vandalized to varying degrees or just outright removed and sold to private collectors. 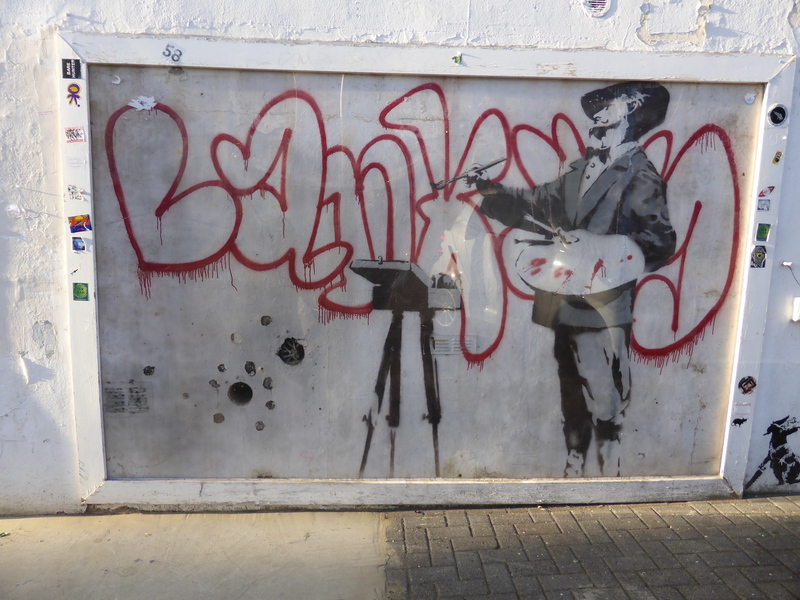 Such worth is attached to Banksy’s works that often now his pieces are covered with Perspex to ensure protection from defacement. 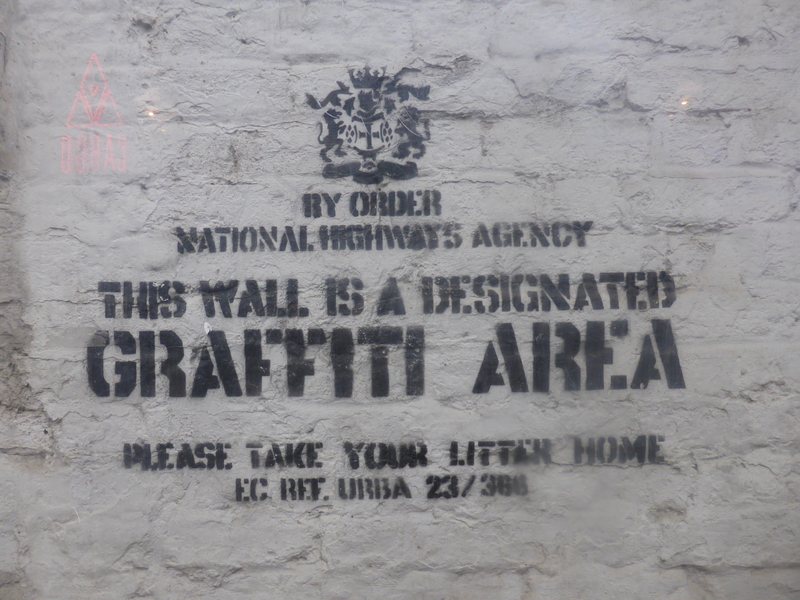 Of the half-a-dozen remaining works, they can be found dotted around, East, West, South and Central London. Our favourite is the well placed ‘Shop Til You Drop’ in Bruton Lane. 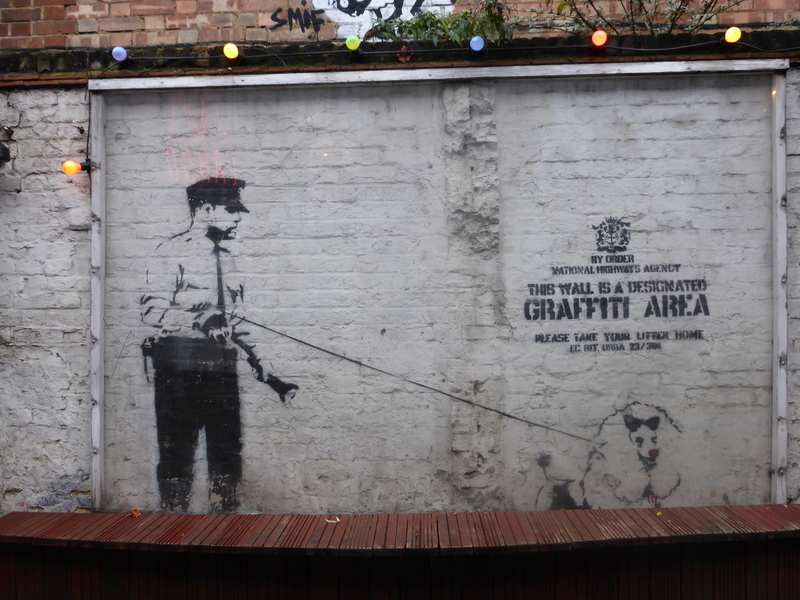 Mayfair, followed by ‘Guard Dog’ in the premises of the Cargo Bar in Rivington Street, Shoreditch. Happy viewing or perhaps happy hunting and if hunting see them while you can. 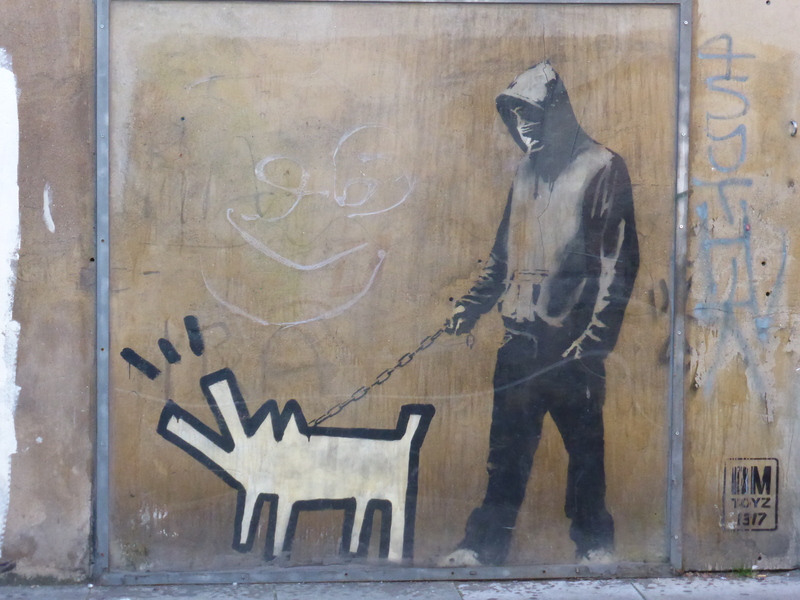 ‘Guard Dog’ – Rivington Street, Shoreditch. 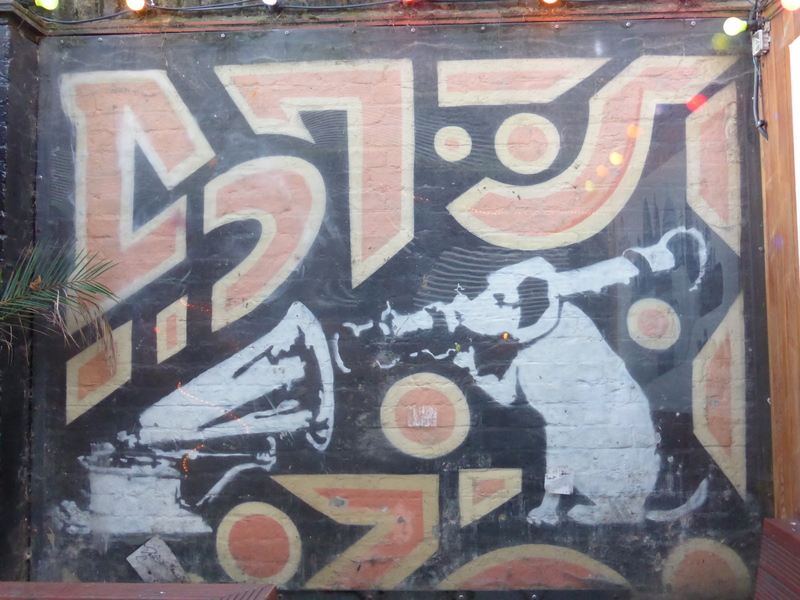 ‘His Masters Voice’ – Rivington Street, Shoreditch. 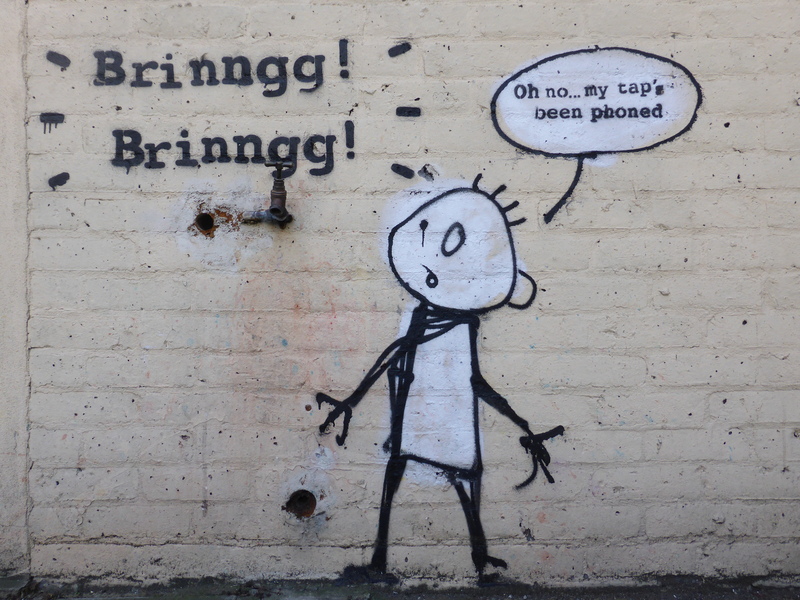 ‘Phone Tap’ – Chrisp Street, Poplar. One of only two pieces you can view currently not behind perspex and also the most recent work by Banksy placed up in London. ‘Shop Til You Drop’ – Bruton Lane. Mayfair. One of only two pieces you can view currently not behind perspex. 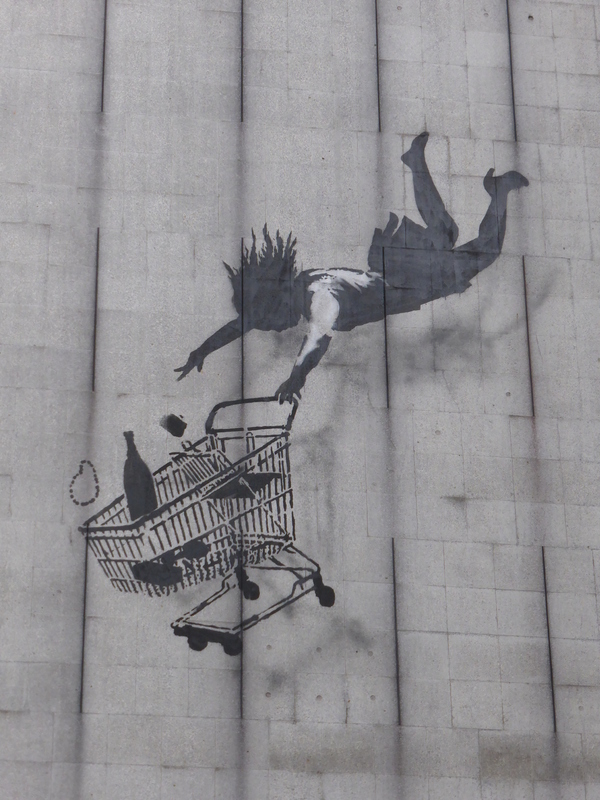 This is our favourite of the remaining Banksy pieces to be seen in London. 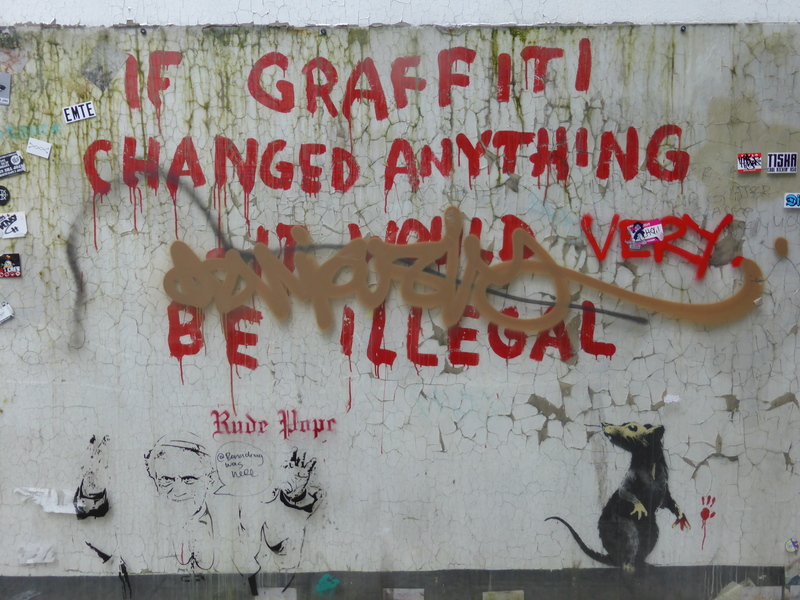 ‘If Graffiti Changed Anything It Would Be Illegal’ – Clipstone Street, Westminster. 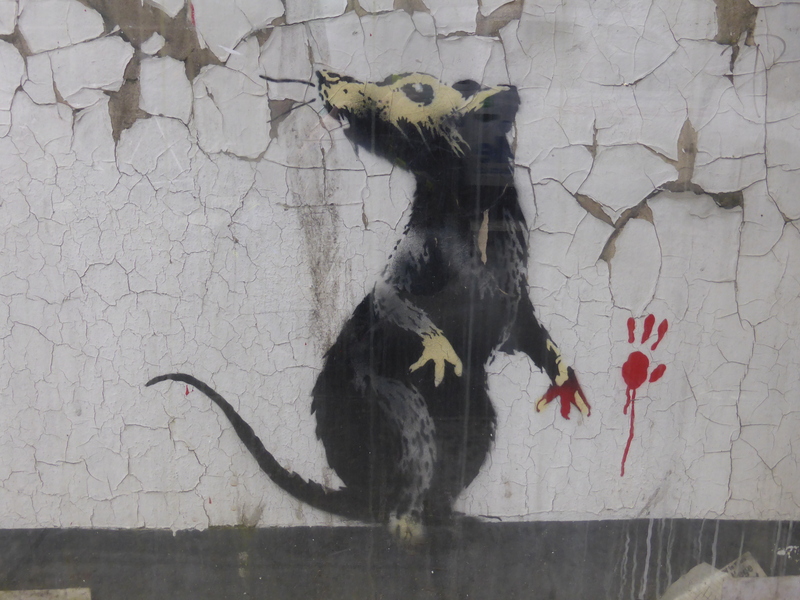 As far as we know this is the last remaining Banksy Rat to be seen in London. ‘Graffiti Painter’ – Corner of Acklam Road and Portabello Road. ‘Choose Your Weapon’ – The Grange, Camberwell. ‘The Drinker’ returned to Soho as ‘The Stinker’ after 11 years (covered here). Work in Knightsbridge placed up opposite the French Embassy setting to criticize and draw attention to the measures the French authorities are taking to deal with refugees in ‘The Jungle’ refugee camp in Calais, namely the use of deploying CS gas as a form of crowd control on the thousands of refugees currently residing there (covered here). Nice post!! You can add the boy fishing in a bucket on Bermondsey Wall. Still just visible and unprotected. I also know of a rat in east London that I’m keeping under my hat!! You can still see the I Love London rat with the added Robbo in East London. No Perspex. Good hunting. No we have this one in our archives. 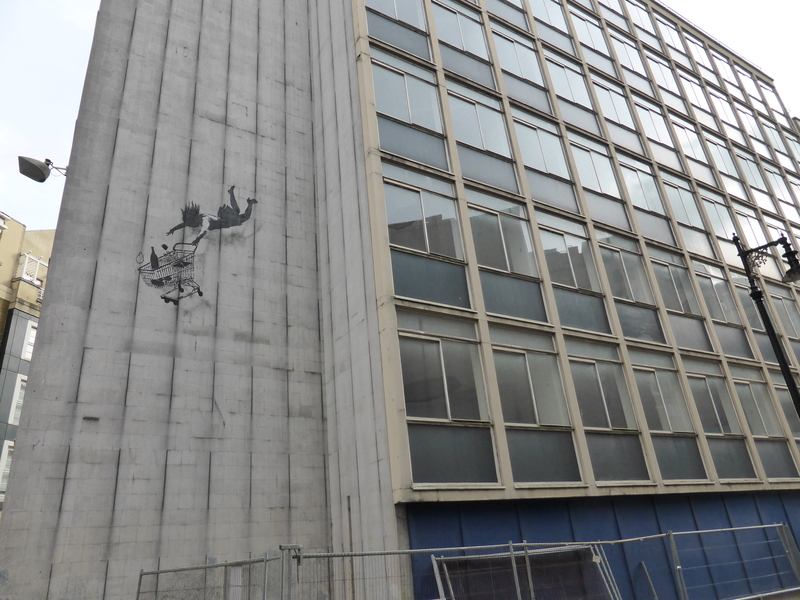 It’s City Of London I believe, and is it Banksy or Team Robbo, or now both? Never saw the Shop til you Drop one before! As a Haring fan I love Choose Your Weapon..